It is believed that Cyril was born and brought up in Caesarea of Palestine in a family of Christians, and that he was soon drawn to the Church. Other than that, very little is known of his life before he became a Bishop. We do know that Bishop St. Macarius of Jerusalem ordained him a Deacon in 355, and was ordained a Priest eight years later by Bishop St. Maximus. In 350 he succeeded St. Maximus in the See of Jerusalem. In a letter that Cyril wrote to Constantius of 351, he wrote about the appearance of a “cross of light” in the sky above Golgotha, witnessed by the entire population of Jerusalem. He regarded this as proof that Constantius’ piety towards God ensured his imperial victory. The Greek Church commemorates this miracle on May 7th. Soon after, the tensions between the Metropolitan of Caesarea and Cyril began to intensify. Also at this time, the influence of the See of Jerusalem was on the rise, as it became a prime Christian holy place of pilgrimage. St. Cyril became well known for his charitable works in the City of Jerusalem. 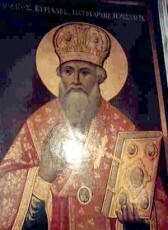 An example – in the mid 350’s the city of Jerusalem was hit with drastic food shortages at which point Cyril secretly sold sacramental ornaments of the Church and a valuable holy robe, fashioned with gold thread that the emperor Constantine had once donated for the Bishop to wear when he performed the rite of Baptism. It is also believed he sold ornaments and many imperial gifts all in the name of charity, to keep his people from starving. Besides his charitable works as Bishop, Cyril had many responsibilities in city life as well. These duties included the administration of justice, negotiating the ransom for captives, teaching and preaching to the masses, converting non-believers, spiritual guidance, political duties, and many other things. He eventually was officially charged with the selling off of Church property, and was exiled for a year. He was reinstated as Bishop upon his return. He remained there until he died in 386. He is highly respected and venerated in the Palestinian Christian Community. Pope Leo XIII declared him a Doctor of the Church in 1883. St. Cyril was born into a Christian family, and was drawn into the Church at an early age. He was ordained a Priest by St. Maximus, and In 350 he succeeded St. Maximus in the See of Jerusalem. He attended the First Council of Constantinople. He was noted for his charity as the Bishop of Jerusalem. His concern was how to assist his people from starving, during a famine one year. He secretly sold off valuable Church sacramentals and holy robes that had been given to him as gifts, in order to get enough food to feed his people. He was Bishop of Jerusalem, and had as many administrative duties on the secular side, as he did Episcopal duties to his Christian flock.